I will admit once in awhile that I need to give my feet a little break. Those poor things have gotten beaten up their entire life. After dancing for about 15 years, I went straight to heels. They’ve never ever had a chance to breathe. I started to notice some nerve pain and I restricted myself from wearing any painful shoes for about a week so that my little footsies can recover. It’s nearly impossible for me to pick out an outfit and that outfit not to be elevated by heels. I knew it would be a challenge but I loved how my high school Nike’s saved the day and actually made the outfit really unique and fun. I really love the idea of throwing on some tennis shoes with a really sophisticated outfit. It’s unexpected and you all know I love that! My lovely Nike’s took this look to a sporty level with it’s small but noticeable athletic touch. I was able to do my thing with comfort and sass. That’s all for now. I’m falling asleep while typing this. It’s been a long day and will be an even longer day tomorrow so I need to get my zzz’s. One thing that I wanted to mention was that I’m reading “Paper Towns” by John Green and OH MY GOSH, I’m hooked. I love reading books before the movie. It’s so satisfying. This is the first book I’ve had the chance to read in a year. I love reading. I don’t know why I ever stopped. If any of you have any recommendations for the next book I should read please feel free to comment below! I really love mysteries and love stories but I’m open to anything. This outfit is so CUTE! 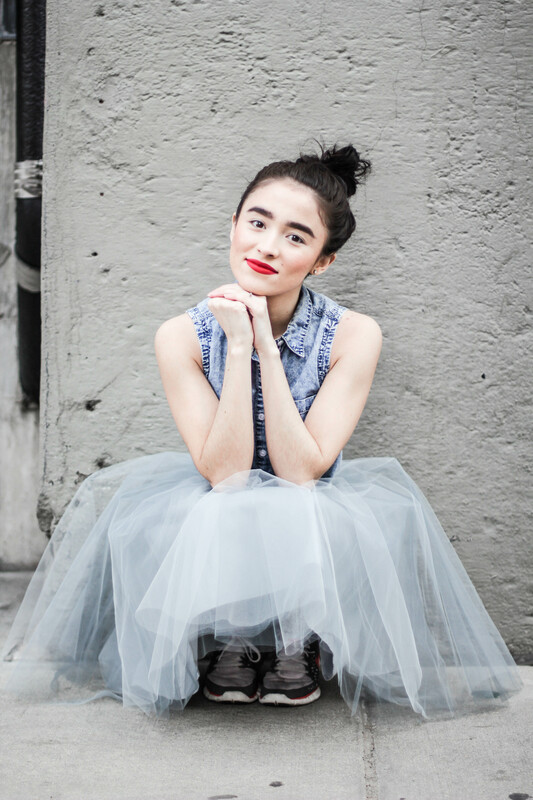 I love the tulle skirt with the jean vest. Great juxtaposition between the two pieces. Great look, love the touch of athletic! The skirt is awesome!